First dates can be nerve-wracking. Not only do you worry about making a great first impression and dazzling your date with wonderful conversational ice-breakers, but you also have to worry about how you look. No pressure! When it comes to the makeup you choose to wear, less often is more. You don't want to show up looking like you're caked in layers of makeup that hides your features. The makeup you wear should accentuate your features and make you look radiant. There's nothing more attractive than a healthy glow. As you can tell, not just any old makeup items will do to achieve lustrous looks, especially because you don't want to end up with your mascara running down your face halfway into the date or your lipstick becoming dry and cracked. To avoid those makeup faux pas, you need to get your hands on the most beautiful and flattering beauty items, not just to knock the socks off your date but to make you feel confident and like you can be your best self. Now that's the kind of makeup that you'll fall in love with. Here are 20 must-have first-date beauty items that will make you feel like a goddess. 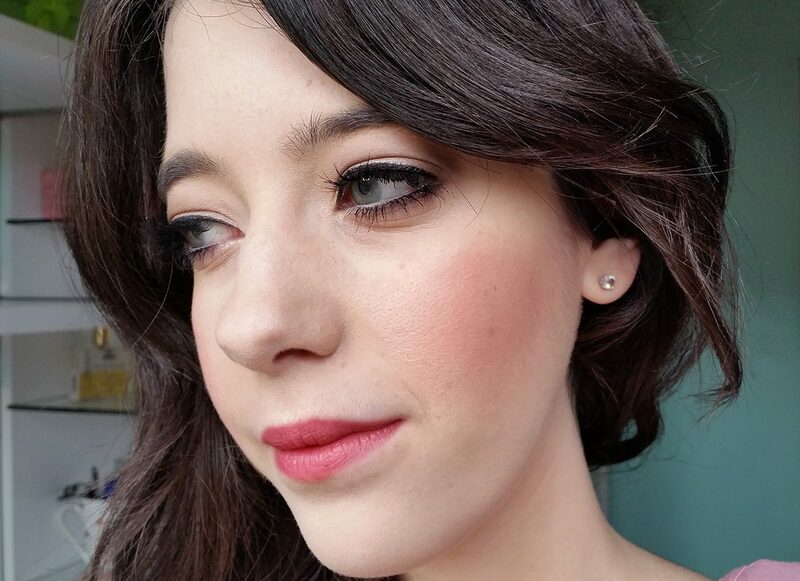 TheBalm FratBoy Blush in a peachy color is stylish and keeps you looking fresh. On a first date, you don't want to wear too much makeup as that can be OTT, so a light, peach or pink-toned blush is perfect to make your skin look healthy and radiant. Not just trendy, these shades are also flattering on every skin tone. Accentuate the highest points of your cheekbones with the blush, and always apply it in natural lighting so you don't put too much. It's also a good idea to apply it before foundation so that it looks most natural. Everyone wants a stunning red lipstick color in their collection, and Chanel Pirate Lipstick is THE red lipstick to own, thanks to its sumptuous color with mild blue undertones that especially look good on caramel skin tones. Named one of the best lipstick colors of 2018 by Vogue, just one swipe of this Chanel lipstick will give you instant boldness for a hot date, while drawing attention to your mouth so your date will want to pucker up. It's also got a fabulous click-open case that will make you feel posh when touching up your lipstick halfway into the evening. Lidstar by Glossier makes shimmer eyeshadow a breeze. Sometimes shimmer shadows can be a mission to get right as it's easy to put on too much, which can look like you threw glitter onto your eyelids before leaving the house. As Glamour reports, these Lidstar colors aren't messy and they set once they dry on your skin, so you don't have to worry about them dripping or caking when you're on your way to meet your date. The eye shimmers come with a doe-foot applicator which makes applying them on your eyelids a cinch, even if you're in a hurry. Everyone wants to achieve radiant, glowing skin, especially when you're meeting someone for the first time and want to positively glow. CYO Bronzing Oil will give you gorgeous shimmer without having to spend time outside in the sun that can damage your skin with its harsh UV rays. You just need a few drops of CYO Bronzing Oil to get a brighter complexion, and it's packed with vitamins to nourish your skin. It also has a nice coconut smell that won't try to compete with your fragrance of choice for the day, which is a nice bonus. Creating winged eyeliner can be seriously high-maintenance. You need a steady hand and lots of time, which isn't always practical. Urban Decay 24/7 Glide-On Pencil makes achieving winged eyeliner much easier. Its thick, crayon-like tip makes application smoother while being waterproof so you don't have to worry about the heat trashing your makeup look. Since its creamy, it's also great to blend, whether with other colors in the range - it comes in black, eggplant, and matte brown - or even eyeshadows in your makeup collection, making it versatile for lots of different looks. You might not want to wear a full face of foundation, but a bit of concealer here and there can help to get rid of any skin imperfections you might have - they always crop up before a hot date, as Murphy's law would have it! Nars Soft Matte Complete Concealer will hide pimples and redness from view, so you don't have to feel insecure about them or take a raincheck. It's got a soft-focus effect that blurs and smooths your skin. Unlike with other concealers, you can build layers of the product without it looking cakey, and it lasts for many hours while you talk, laugh, eat, and enjoy yourself. Smashbox Photo Finish Primerizer makes your skin glow! It's a must-have for your makeup bag, especially if you struggle with dryness that can make your skin look dull. It has a thin liquid consistency, which might make you think it's not moisturizing for your skin, but it is, which results in it being a perfect base for your makeup because it smooths and hydrates in one go. Any makeup you apply on top of this primer will look much more natural and beautiful, while it also makes your foundation stick to your skin, lasting for much longer. EOS Smooth Sphere Lip Balm not only looks cool enough to carry around, but it lasts all day, giving you kiss-ready lips. When your lips are smooth and soft, your lipstick and lip gloss will look so much nicer than if your lips are dry. The best thing about this lip balm is that it has 100 percent natural flavor and avoids chemicals. It's also gluten-free. Instead of toxins, this lip balm's enriched with Shea butter, jojoba oil, and Vitamin E, so you not only achieve softer lips but healthier ones, too. It's important to look after your pout! Sometimes you might want to ditch the lipstick in favor of a low-maintenance lipgloss that makes you achieve a perfect pout with fewer touchups throughout the day. I hear you. Fenty Beauty Gloss Bomb Universal Lip Luminizer comes in dreamy shades and makes your lips the star of the show. A few swipes and you've got a gorgeous pout. What makes it extra special is that it makes your lips look fuller and it's got a non-sticky formula. It's also a nice touch that this lipgloss smells like peaches and vanilla, so you can be scent-sational on your first date. Delicious! If you don't have a makeup setting spray, you need to get your hands on one now! Try this: e.l.f. Matte Magic Mist & Set. It not only looks chic in its black bottle, but it will lock down your makeup without being drying for your skin. But, it also prevents too much shine which can leave your skin looking oily, so it's perfect for all skin types. e.l.f. Matte Magic Mist & Set is enriched with healthy skin ingredients, too, such as Vitamin B, E, and arctium majus root, which is a skin conditioner to keep your complexion smooth and radiant. If you want to wear false eyelashes to your date, consider something a bit more natural instead. Make the most of your natural eyelashes without the fear of a false eyelash falling into your salad by choosing Benefit Cosmetics Roller Lash Curling Mascara. It gives you longer, curlier lashes that look great but accentuate your natural beauty. This mascara is a must-have simply for how good it works at separating your lashes, while boosting their length, so even if you don't have naturally long lashes you can flutter your eyes at your date with confidence - and avoid any clumps or smudges from happening. If you don't have a face gloss in your collection, you might wonder why you need one. Well, there are really good reasons why you should get your hands on one, such as Make Beauty Face Gloss. It's beautifully hydrating for skin and refreshes your complexion. Since its free of any color, it works well to give natural, makeup-free skin a brighter appearance, or to create a bit of a sheer effect over your makeup when you use it as a highlighter. It's a crucial part of completing your makeup look, and you can even wear it over eyeshadow to give you extra shine. Your eyebrows frame your face and accentuate your features so you need to ensure that they're shaped well. That's why you should brush them with a product such as Pretty Vulgar High Standards Eyebrow Brush. It's actually a double-sided brush. One the one side, you get an angled brush that helps you create clean brow lines with its stiff bristles. On the other side, you get a spoolie that helps you get beautifully and accurately-shaped eyebrows. If you like double-duty makeup items (and who doesn't? ), the angled brush can also be used as an eyeshadow applicator to create flawless eye makeup. Everyone needs a quality glitter eyeshadow in their makeup bag, especially when getting ready for a date when you want to shine! Tarte Tarteist Metallic Shadow is fun and vibrant, perfect for getting some dazzle on. It comes in a range of different colors that are long-lasting and contain metallic formulas that make them really easy to blend while being rich in pigment. To avoid too much shine, especially if your date's happening in the day, apply some of this metallic shadow over a matte eyeshadow to make your eyes brighter and more glamorous in a flash. It's not just your face and eyes that need some shine, but your body too. When your shoulders, neckline, and arms look radiant, this completes your look and gives you head-to-toe glamor. Pacifica Crystal Glow Power Shimmer Body Lotion contains rose crystal extracts, sunflower oil, and aloe to make your skin more hydrated and ravishingly bright. It also has a watermelon scent, which is perfect for those cool summer night dates when you want to look and feel lit from within. Pro tip: wear it over your body moisturizer if your skin's dry so that the shimmer is applied evenly. Your hands are one of the first body parts people notice, so you want them to look well looked after and beautiful. That means you not only need to keep them soft but also get a gorgeous manicure. You can do it yourself with Nails Inc Gel Effect Nail Polish. This is a long-lasting product that provides gorgeous color and lots of glossy shine, so you can feel confident about having your hands on show. It's got a rare flower extract that strengthens your nails and a high-reflection resin system that maintains its shine for longer so you don't have to worry about chips and fading. There are glitter and shimmer eyeshadow, and then there are metallic colors. These offer high-powered shine that can heat up your date look. Best of all, you only need a little bit to get that sparkling effect. Applying metallic eyeshadow such as ISH Shimmy Shadows to the inner corner of the eyelids widens and brightens your eyes, without being too strong such as if you wear them all over your eyelids - save that for the next date when you go to a club. As reviewed by Allure, this shimmer eyeshadow is the most glittery one on the market, so it's a must-have for serious shine. You can't look gorgeous with the makeup you're wearing if you haven't looked after the skin that's underneath it. For that, you need a really good moisturizer. Lakme Absolute Skin Gloss Gel Crème sounds beautiful and it gives your skin gorgeous, natural moisture so it can look its best. This gel-based moisturizer goes on smoothly during application and doesn't become greasy, but it does give your skin an instant glow. These factors make it a great foundation for makeup. It also has a cooling effect on your skin that matches its ice-blue appearance nicely, making it great for summer. If you like wearing full coverage in the form of foundation, you need to get a product that won't let you down and disappear after an hour of wear. M.A.C. Pro Long-Wear Foundation gives you a polished complexion for hours. Although it's matte, it has a slightly dewy finish, which means your skin gets a glossy appearance and coverage in one product. It's also good at hiding any redness or acne scars from view, without being too heavy for your skin. With such polished skin, you won't need to wear many more makeup products, which makes getting ready for a date a breeze. When you think of face powders, you probably think of heavy, dry products. But not this one. Neutrogena Healthy Skin Pressed Powder gives you good coverage and contains antioxidants that keep your skin smooth. It feels really light on your skin without drying it out or making fine lines more noticeable. Yay! In fact, it's got light diffusers that make any skin imperfections look less noticeable. Wearing this powder will make you look like you're not even wearing much makeup on a date, which is a good thing because you'll be able to let your natural beauty shine.